Enough of watching IPL. It's time to show your own cricket skills. 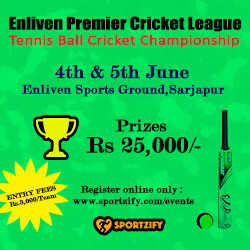 Be a part of this epic tournament and win some big cash prizes. Category - Tennis Ball Tournament. League format with 10 overs per side. 11 a side team.